Imp. Hungary, in aanvraag/en attente. ° 21/12/010. V/P : Bery Spod Holy. Ref. 40. N.H.S.B. 2806142. ° 13/08/010. V/P : Dralions Sherwood Wookie Krozairs of Kregen. M/M : Hotsand Walker Wolfsbane. Jason du Domaine de Straz. Ref.28. LOSH : 1079041. ° 04/04/010. V/P : Exsto del Fracasso. M/M : Hermione du Domaine de Straz. F/E : Domaine de Straz- Strazzeri. Ref.44. LOSH : 1069453. ° 11/09/09. M/M : Blazolynns Ladfy Aegle. E/P : Bas Bosch & Dieter Lessner. 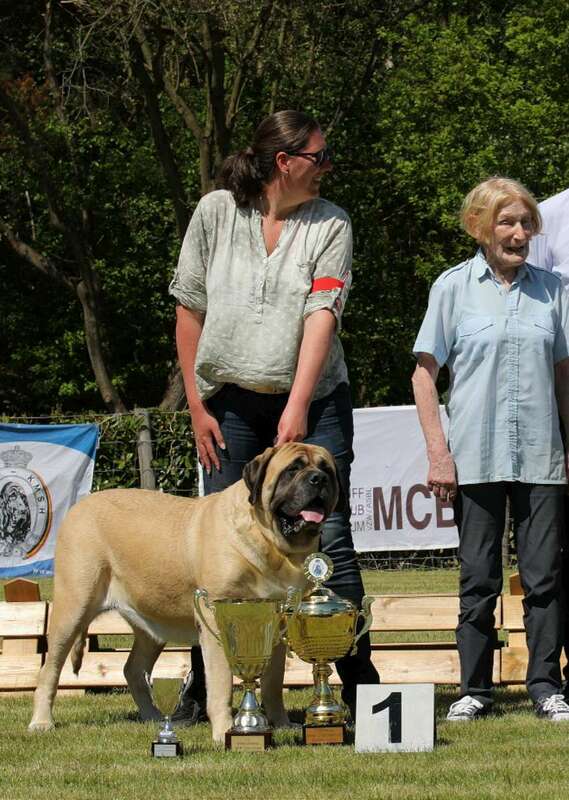 Mufasa of the Mounainous Mastiff’s. Ref:8. N.H.S.B. 2697999. ° 31/03/08. Ionesco du Domaine de Straz. Ref.27. LOSH: 1053866. ° 16/01/09. V/P : Multi Ch. Valesco de Molossie. M/M : Alba de la Louvagerie. F/E : Domaine de Straz – Strazzeri. Miss Molly Of Seven Oaks. Ref.46. VDH/MOL10/MA 795. ° 20/11/10. V/P : Cardhu Special Of The Royal Club. Ref.34. N.H.S.B. 2806566. ° 17/08/010. V/P : Mufasa of the Mountainous Mastiff’s. M/M : Babs of the Mountainous Mastiff’s. Ref.13. BE/RSH 9129364. ° 29/11/09. V/P : Damaco Brynaeron of Bredwardine. Ref.26. LOI 09144150. ° 17/07/09. M/M : Diamante Del Fracasso. V/P: Ch. Hulk Hogan of Seven Oaks. M/M: Ch. Ice Tea of the Mountainous Mastiff’s. E/P: Isolde Schmidt & Dieter Lessner. Ref.33. LOSH: 0995265. ° 31/05/06. Ref1. LOF 003510/793. ° 19/04/08. E/P: Mr. Lemaire – Melle Betombo. Paint it Black U’ Simply Sabian.